When you apply and meet minimum spending requirements you can earn 30,000 bonus Starpoints, enough for up to 15 free nights at a Category 1 hotel or 10 free nights at a category 2 hotel! You get 30,000 Starpoints after you make $3,000 in purchases within your first three months of cardmembership. To put it all in perspective, for just 2,000 Starpoints you can snag a free weekend night in a standard room at a Category 1 property, so clearly 30,000 points can go pretty far if you’re a frugal traveler. Hotels on the higher-end include the St. Regis, The Luxury Collection, W Hotels, Le Meridien, Westin, Sheraton, Aloft, Element, and Four Points by Sheraton. If you’ve already got a place to stay, you can use your Starpoints for air travel as well. This is quite a popular option because of the bonus you earn at redemption. Most airlines that are partnered with SPG accept Starpoints at a one-to-one (1:1) basis, and you get a 5,000-Starpoint bonus when you transfer 20,000 Starpoints into miles. So really it’s better than one-to-one in many cases, which is the appeal of the Starwood Preferred Guest card. We’re talking 1:1.25, or a 25% bonus on points when you redeem in 20,000 increments. For this reason, it’s important to transfer points at multiples like 20k, 40k, 60k, 80k and so on to get the most bang for your buck, err, points. And it’s fairly easy to earn Starpoints, as you get up to five per eligible $1 spent at participating hotels and resorts and one for every $1 spent elsewhere. And there is NO limit to the amount of Starpoints you can earn! Starpoints can be redeemed at over 1,000 hotels & resorts in nearly 100 countries, and for free flights on over 350 airlines, with no blackout dates. Another good use of Starpoints is to transfer them to Marriott, now that the two companies have merged. For each Starpoint you transfer to Marriott, you get three points. That’s a 1:3 ratio. Put another way, it means you earn three Marriott points for each dollar of spending on the Amex SPG card. Once points are at Marriott, you can also book Ritz-Carlton hotels, another brand owned by Marriott. This means you’ve got tons of hotel options depending on where you put the points. It also means you can apply for multiple hotel credit cards and earn a ton of points between them. For example, you could apply for the SPG Amex and earn 30k points, and also apply for a Chase Marriott card that earns 80k points. Combined, you’re looking at around 185k Marriott points, or about 60k Starpoints. That should be enough to get you a nice long hotel stay, and perhaps even a fifth night free in a category 5 SPG hotel or a category 9 (the highest) Marriott property. Tip: Chase allows you transfer points to travel partners as well (including Marriott) via their Ink and Sapphire cards and you can earn 5x in multiple categories, making it perhaps a better deal for those looking to accomplish the same thing. What Other Bonuses Come with the SPG Card? If you use the Starwood Preferred Guest card to book two consecutive nights at any participating Sheraton hotel or resort, the third night is on American Express. Once you reach elite status you may also receive free hotel room upgrades upon check-in, along with 4 p.m. late check-out when available. If you use the Starwood Preferred Guest card to rent a car you can decline the collision damage waiver at the rental car counter, as the card offers Car Rental Loss and Damage Insurance. The card also offers up to $100,000 in Travel Accident Insurance. The purchase credit card APR will be a variable 16.24% to 20.24%, based on your creditworthiness and fluctuation of the Prime Rate. So it’s not a good credit card to carry a balance with, rather to pay off in full each month and reap the associated rewards. There used to be a balance transfer deal with this card – 2.90% for the first six months, but it has since been removed. Regardless, you’d be better served with a full-blown 0% APR credit card if you need to transfer a balance. One downside is that the Starwood Preferred Guest Credit Card has an annual fee of $95, but it’s waived for the first year. In summary, if you like to travel and stay at hotels often, the Starwood Preferred Guest card could save you a great deal of money. In fact, many consider it the best travel rewards credit card in existence because of the redemption value of the Starpoints! Compare other travel credit cards: American Express Blue Sky Review and the New Southwest Credit Card Review. American Express has been revamping some of its cards lately, including the Amex Gold Card and the Amex Premier Rewards Gold Card. The SPG card is no different – come August 11th, 2015, this card will no longer charge foreign transaction fees, which is a no-brainer given its premium travel card nature. Additionally, cardholders will get complimentary, unlimited Boingo Wi-Fi and in-room internet access at SPG participating hotels. Those with the SPG Business Credit Card will also gain access to Sheraton Club Lounges, which includes things like free daily breakfast and cocktails and hors d’oeuvres at night. The downside is that the annual fee will increase from $65 to $95 (which aligns with Chase Sapphire Preferred), though it will still be waived the first year. I actually applied for this card for reasons most don’t. To get more Marriott Rewards points. 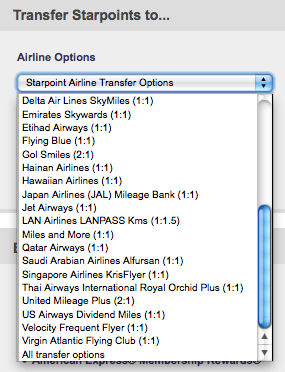 As noted, you are able to transfer Starpoints to Marriott Rewards points at a 1:3 ratio. I received a sign-up bonus of 30,000 Starpoints when I applied for the SPG card. That resulted in more than 33,000 Starpoints with the $3,000 minimum spend, meaning I’ve got about another 100k Marriott Rewards points at my disposal. Of course, that was just my plan when I applied. I still have the freedom to do other things, like transfer the Starpoints to an airline, or simply redeem them for free stays at Starwood hotels. There’s lots of flexibility and because the annual fee is waived the first year, it’s a pretty solid offer not to be missed. Next Next post: Are Credit Cards with Annual Fees Worth It?